Timber framing and “post-and-beam” construction are methods of building with heavy timbers rather than dimensional lumber such as 2″x4″s. Traditional timber framing is the method of creating structures using heavy carefully fitted mortise and tenon joints secured by large wooden pegs. It is commonplace in wooden buildings from the 19th century and earlier. The method comes from making things out of logs and tree trunks without modern high tech saws to cut lumber from the starting material stock. Using axes, adzes, and draw knives, hand-powered auger drill bits (bit and brace), artisans or farmers are able to assemble a building capable of bearing heavy weight without excessive use of interior supports. Since this building method has been used for thousands of years in many parts of the world, there are many styles of historic framing. These styles are often categorized by the type of foundation, walls, how and where the beams intersect, the use of curved timbers, and the roof framing details. Three basic types of timber frames in English-speaking countries are the box frame, cruck frame, and aisled frame. 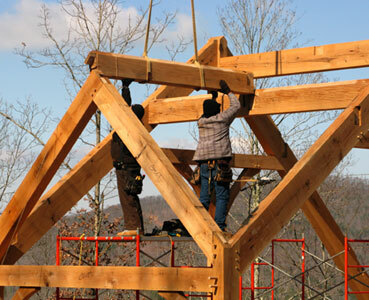 In the United States and Canada, timber-frame construction has been revived since the 1970s, and is now experiencing a thriving renaissance of the ancient skills. 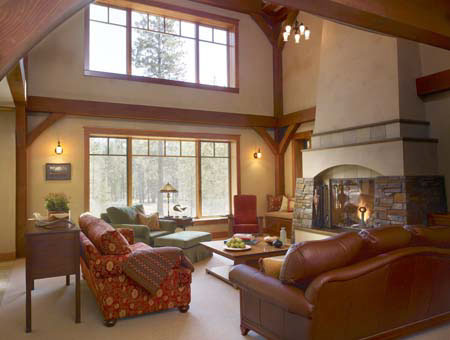 Once a handcrafted skill passed down, timber-frame construction has now been modernized with the help of modern industrial tools. These machines and mass-production techniques have assisted growth and made for more affordable frames and shorter lead-times for projects. 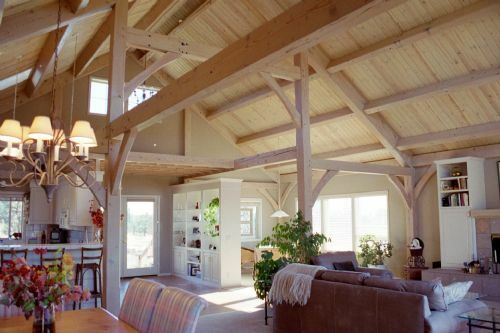 Timber-framed structures differ from conventional wood-framed buildings in several ways. 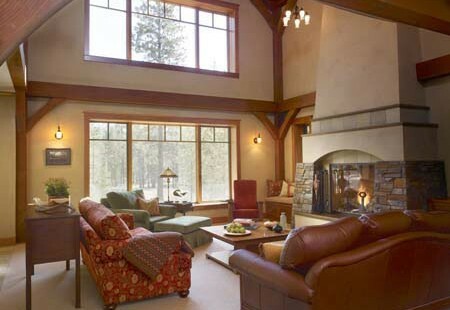 Timber framing uses fewer, larger wooden members, commonly timbers in the range of 6″ to 12″) while common wood framing uses many more timbers with dimensions usually in the 2″ to 10″ range. The methods of fastening the frame members also differ. In conventional framing, the members are joined using nails or other mechanical fasteners, whereas timber framing uses the traditional mortise and tenon or more complex joints that are usually fastened using only wooden pegs. Modern complex structures and timber trusses often incorporate steel joinery such as gusset plates, for both structural and architectural purposes. Recently, it has become common practice to enclose the timber structure entirely in manufactured panels such as SIPs (structural insulated panels). Although the timbers can only be seen from inside the building when so enclosed, construction is less complex and insulation is greater than in traditional timber building. Structural Insulated Panel construction uses composite members consisting of “an insulating foam core sandwiched between two structural facings, typically oriented strand board,” according to the Structural Insulated Panel Association. SIPs reduce dependency on bracing and auxiliary members, because the panels span considerable distances and add rigidity to the basic timber frame. Autoclaved Aerated Concrete, Insulating Concrete Forms, and Compressed Earth Block are sometimes used to fill in timber frame structures. An alternate construction method is with concrete flooring with extensive use of glass. This allows a very solid construction combined with open architecture. Some firms have specialized in industrial prefabrication of such residential and light commercial structures.